The QL40-OCEAN Idronaut Ocean Seven 303 probe combines a multi-parameter sensing unit manufactured by Idronaut srl, Brugherio, ITALY. This water quality probe is specifically designed for groundwater and environmental investigations. It uses reliable, accurate and drift-free high quality sensors and records a continuous profile of the borehole fluid properties. In the standard configuration, the QL40-OCEAN probe is equipped with six sensors to measure: Pressure, Temperature, Conductivity, Dissolved Oxygen, pH and Oxidation reduction (REDOX) potential. The probe can be customized upon request with up to seven sensors from a list of additional ION selective sensors (such as Nitrate, Ammonia, and Chloride). 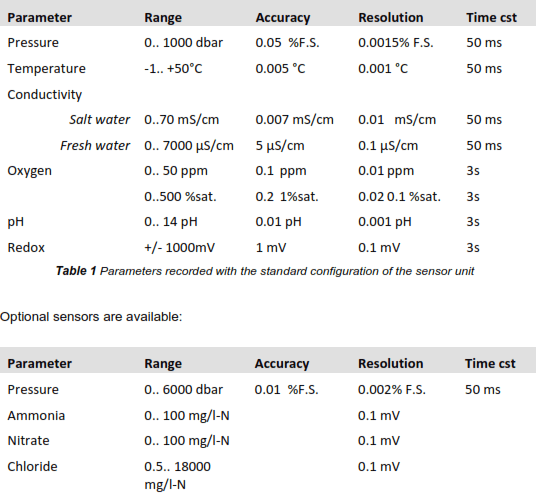 In operation, the user can define the conductivity range for fresh or sea water environment and configure the tool processor for computing properties as: Conductivity corrected at 20°C and at 25°C, Fluid density, Salinity, Speed of sound, and O2 saturation in ppm. The QL40-OCEAN can be combined with other logging tools of the QL (Quick Link) product line or can be operated as a standalone tool. The only water quality tool of its kind that can collect detailed data at high pressures and temperatures. Weight 5.45 Kg 12 lbs. QL40OCEAN + QL40GR (Gamma) + QL40DEV (Deviation): Identification of Aquifers correlated with well path.